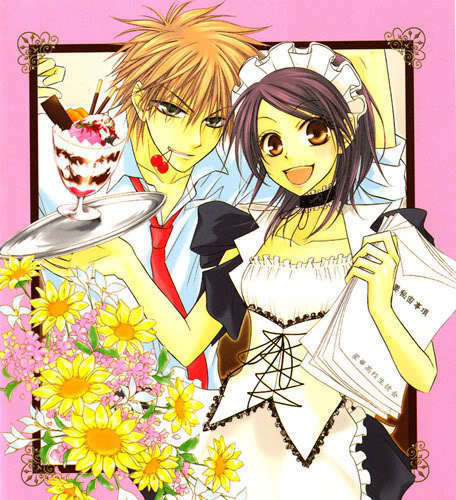 Our hero and heroin in this manga are Ayuzawa Misaki and Usui Takumi. Ayuzawa Misaki is student council president in her school. She has one dislike : Guy. Unfortunately, her school was an all boy school, it’s means that the school has more boys than girls. that why she decided to create a “heaven” for girls in the school. Usui Takumi on the other hand is a popular boy, he is smart, good in sports, and he is respected by other student both girls and boys. He has past that still unknown until now, he lives in an apartment alone. Until know i still don’t know about his family or his background. The story is about Ayuzawa Misaki who wants to create “heaven” for all girls, and some time she went far too much to discipline boys student. She is known as good student, well behavior, and has “scary” personality. But beside that Ayuzawa has a secret that she hide from everyone. She is secretly working as a maid in maid cafe. She success hide her job until Usui find out about that. Thus the story about Ayuzawa and Takumi relationship was begin. She want to hide this secret no mater what, and usui who only want to tease her (at first) because if the student found out about her job, she wont be respected anymore by other student, and she want Usui to keep the secret. Even though the story mainly revolve around those two, but this story also about their relationship with other peoples, their family situation ( i think it has relationship between ayuzawa family condition with her dislike for guy, but still not clear enough ), their friend, how Ayuzawa learn to trust guy, not only girls. when i read this manga, some time i smile or laugh, because the student’s reaction to ayuzawa, because for them ayuzawa is like demon who want to destroy their kingdom. there is also three peoples who know about ayuzawa secret, but they didn’t reveal it to other student and they become ayuzawa fans instead. it’s so funny to see how the trio ( i call them the trio) try to see ayuzawa everyday in maid cafe, even though they only have enough money to buy a cup of coffe or when they want have picture with ayuzawa.